Living in a cold climate like Ottawa makes having a means of staying warm while pregnant, and also for winter babywearing a necessity if you enjoy walking. Given that we have a dog and that I'll be commuting to work by walking and public transportation for the next few months, I sought out a solution for this early on. 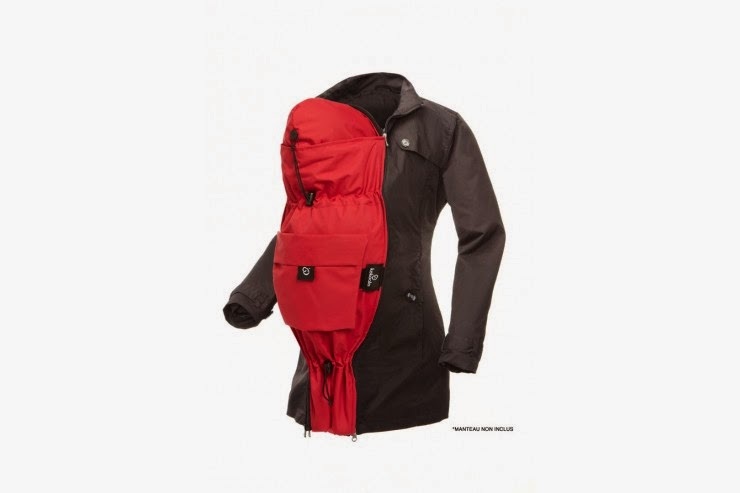 An extension panel is a panel that zips into your existing jacket and adapts for two modes: pregnancy, allowing for your larger belly, and babywearing, which provides extra space for you to wear your baby using a wrap or carrier under your jacket. 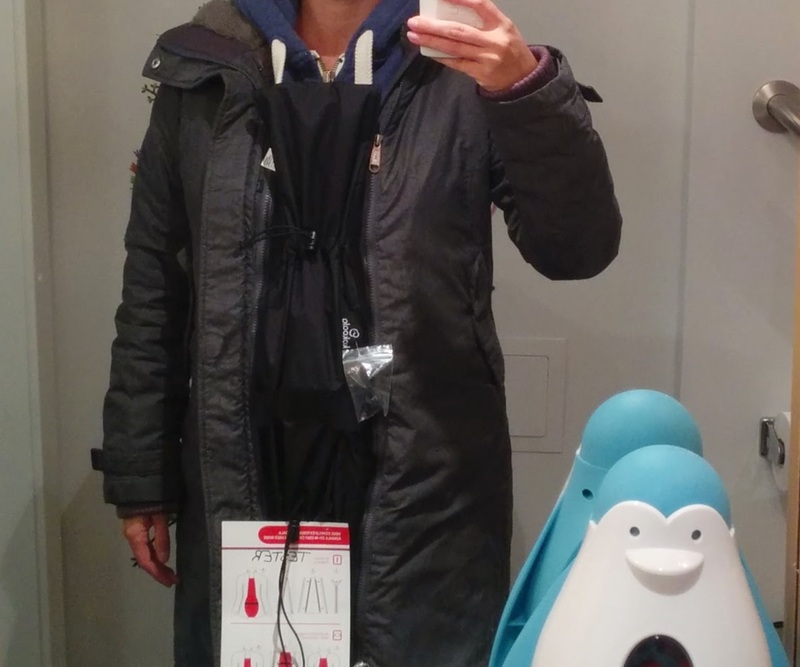 An additional benefit of getting a panel instead of a dedicated maternity or babywearing jacket is that your partner can use it as well, so long as you have the right adapter for their jacket. There are quite a few options out there, including custom options made on Etsy, however, I chose to select from two Canadian companies available for purchase in Ottawa so that I could try them on before deciding. These two companies are Kokoala and MakeMyBellyFit, both with excellent and responsive customer service. Just like different jackets fit and look better on certain body types, I found that extension panels are the same way. They look better with certain jackets depending on your height and the length of your jackets. When I tried these on, I was in my second trimester at 24-25 weeks and my jackets just barely don't zip up anymore, so the panel is necessary but provides more space than I need at this point. I'm 5'4, and I found that for both of the panels, I got the best look and fit with jackets that hit a mid-point on the thigh. 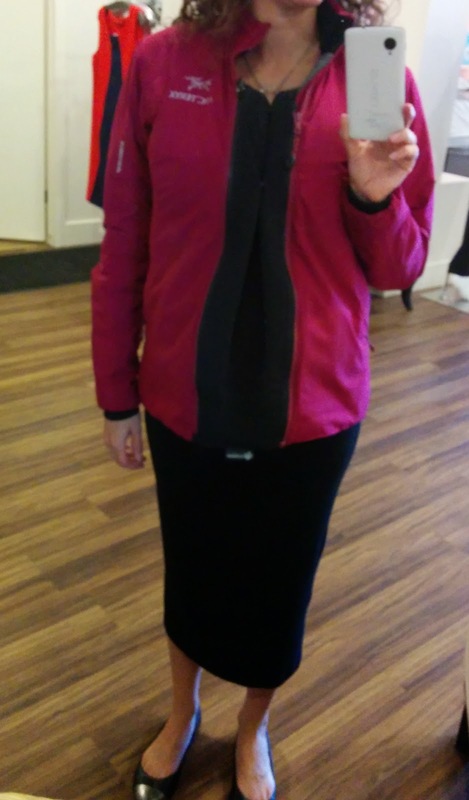 With a long jacket, the panels fall a bit short, and with a very short jacket, they fit a bit too high. The first option I considered is the Kokoala. In Ottawa, I was able to try this on at both Baby enRoute and Milkface, but they are available in many Canadian cities. The Kokoala extension has more of a traditional jacket finish, almost resembling Canada Goose jackets, with the shell made of 100% waterproof nylon. Different zippers are attached using velcro, which I prefer because it means that no matter the zipper you use, the width of the panel remains the same. If you purchase it directly from Kokoala on their website, you can purchase this panel with any one zip to start. 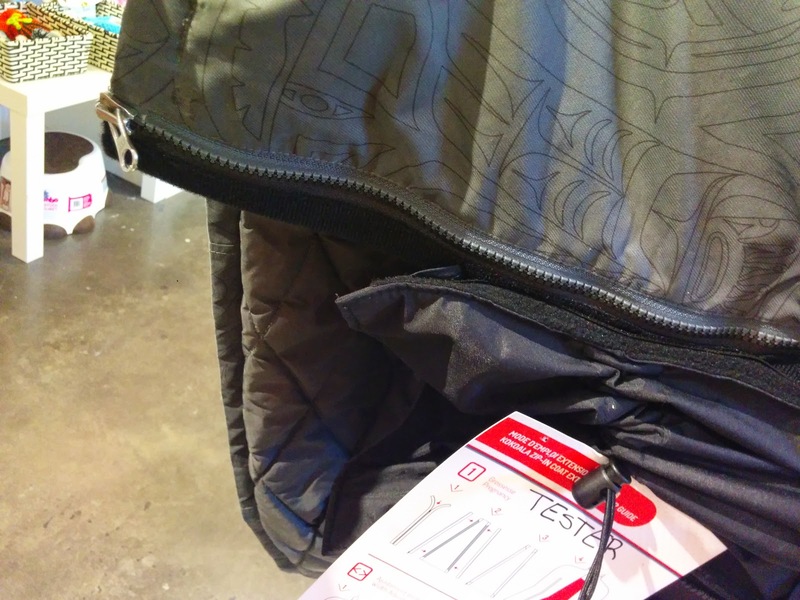 If you have a non-standard jacket you plan to use the panel with most of the time, this can be an advantage, as you save yourself $15 given that the cost of the adapter includes one zipper of your choice instead of having to buy both the panel and an adapter. The way it adjusts is using two adjustable pulls to tighten the jacket below and above the belly. It looks stunning on their website with the right jackets. Unfortunately for me, those pulls only line up with my belly when used with my long jacket. With my short jackets, the pull which should have been under my belly lined up with my belly button, and the pull that should have been over my belly was over my chest. This meant I had to tighten them a bit less. With my long jacket, it lined up really well by positioning the velcro zipper at the correct height and then folding over the top inside. My long jacket used the same adapter as my short jacket because of the velcro, which means another potential $15 saved. This video shows how you can adjust the zipper using velcro for different jacket types. Here are pictures showing the bottom of the jacket with the panel velcro'ed in just above where the zipper starts, to help it sit at the right height. On their website, they currently only allow you to purchase a deluxe winter option or a spring option, which led me to prefer the MakeMyBellyFit, which has an optional fleece you can zip in. However, via email Kokoala assured me that a new option will be available in the next couple of weeks that has a removable warmth layer, which I prefer as it means the same panel can be used at any time of year. This second option, the MakeMyBellyFit BellyFit Panel, is also created by a Quebec company. 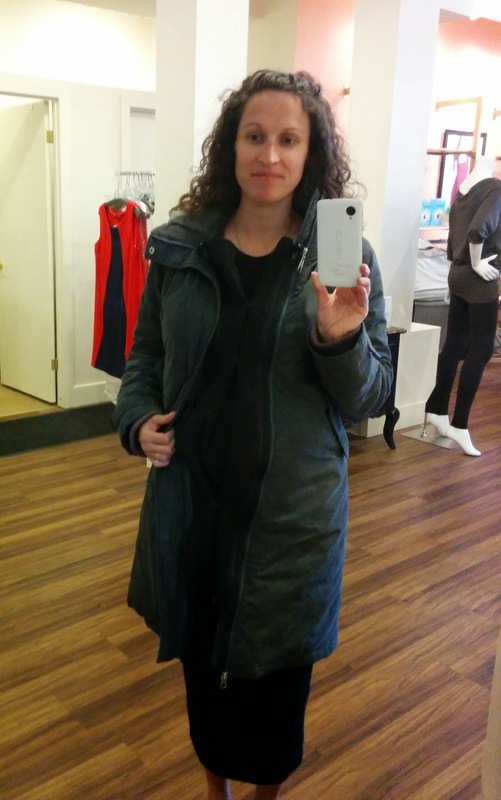 I was able to try it on at Queen Mother Maternity in Ottawa, but is also available at these retailers in Canada. Baby enRoute usually carries it, but hasn't received new stock yet. MakeMyBellyFit's width is adjusted using snaps that line up all along the way, which allow you to adjust any section of the panel to a smaller width. However, I haven't put on much weight around my chest, so it fits a bit big over and under my belly. This is because the snaps still provide a bit of additional space in areas you don't require it, as you can see in the pictures. I should mention that the same is true for the Kokoala panel, they both add in extra fabric in areas you may not have grown. 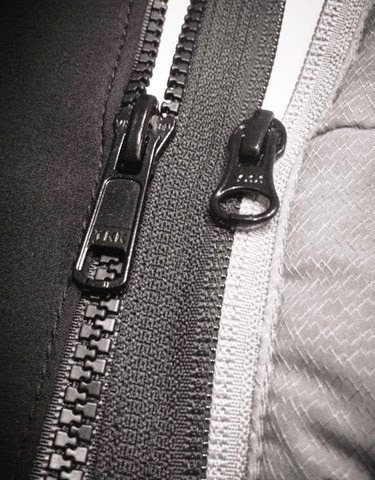 This panel always comes with a 5VS zipper, which is the default zipper used on most sport winter jackets. 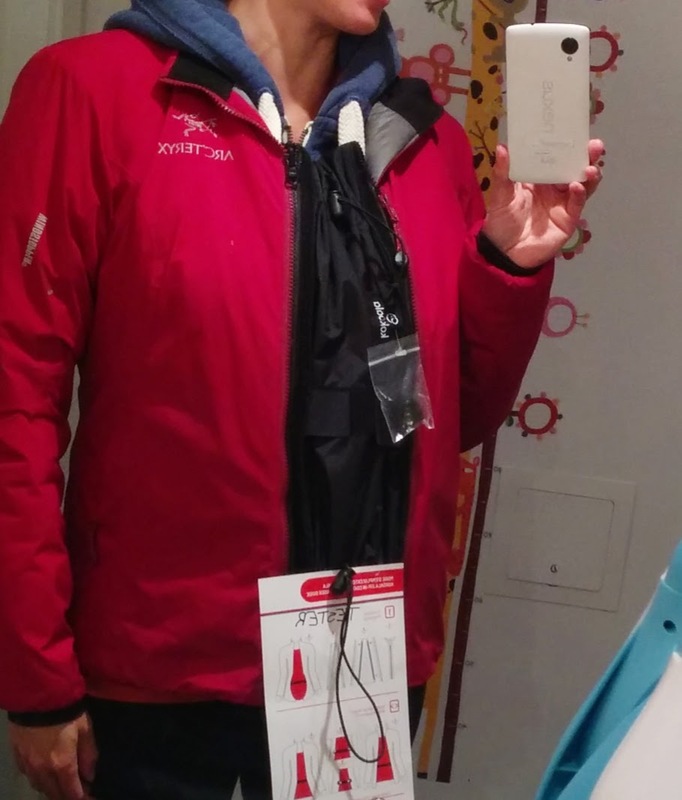 My fiancé's jacket has this zipper, but only my Arc'teryx jacket uses it. The long TNA jacket uses this type of zipper as well, but it requires a zipper adapter to get the panel to sit at the right height, unlike the Kokoala with which you can just reposition the same zipper using velcro. The zipper adapters zip onto the panel, which I personally find to look cleaner, however, it means that on some jackets the panel becomes a bit wider as you're adding on the width of the adapter. An advantage of this zipper method is that you can leave the adapters on your various jackets, and zip out just the panel when you switch between jackets. This panel definitely fits me better, though not perfectly -- I think after this experience I've come to accept that in pregnancy, there is no such thing as a perfect fitting jacket given that your body is constantly changing! Here are pictures with two of my jackets. 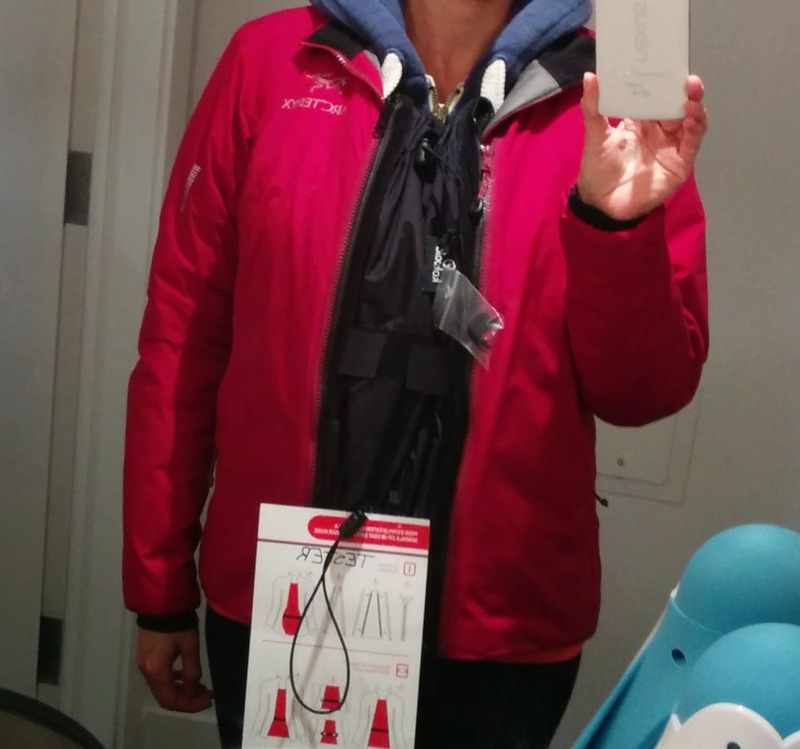 I wasn't able to try it with my other jackets as no store in Ottawa carries the MakeMyBellyFit zipper adapters I require for them. When evaluating, it pays to to ask for a salesperson that has experience with these panels, especially the Kokoala. 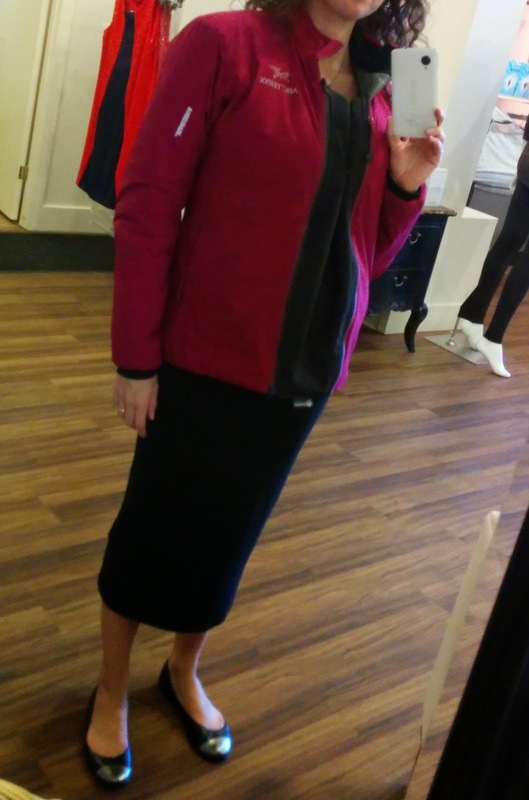 When I first tried it on, I didn't think it could work for me at all, however, an experienced salesperson at Baby enRoute was able to show me how to adjust the zipper to make it sit just right with my belly which makes all of the difference. 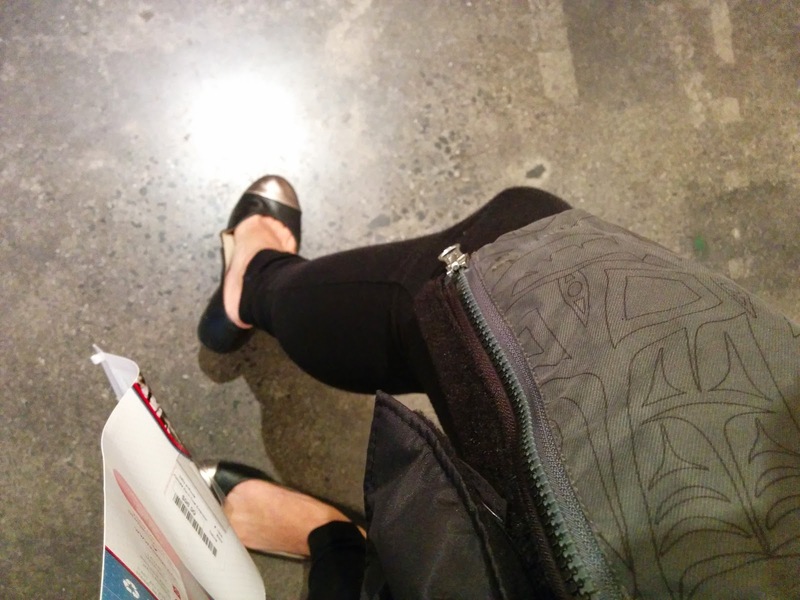 In the end, the MakeMyBellyFit panel fits with most of my jackets best, but both options are really good candidates. I think to decide between them you need to factor in which jackets you plan to wear the panel with most often. Kokoala is best if you plan to use it with a single jacket / zip style a season, as removing and putting zippers on and off is more time consuming given that you really want to take the time to line up the zipper at the right height. The panel itself has a really nice jacket finish and a clean look which I prefer to the MakeMyBellyFit, so its no surprise that it's a best seller in the stores that I visited. The MakeMyBellyfit is a better choice for you if you plan to use multiple jackets regularly which all require different zippers, as these can stay on each of the jackets and you can just zip in the panel. You might also decide that this isn't necessary at all. I have quite a few friends that walked around with open jackets while they were pregnant, maybe using a belt to keep the jacket somewhat closed. For babywearing, I've heard from experienced moms that simply keeping your jacket open and using blankets to keep your baby warm can work surprisingly well. Thank you for this review. Do you possibly know how many coat extensions that are sold in Canada yearly? Or do you know where to find out? The two most-known manufacturers in Canada may be able to share their corporate statistics with you. Kokoala (http://www.kokoala.ca) and Make My Belly Fit (http://makemybellyfit.com). In my experience both are very responsive to email. It uses a clip on system, so you can use it on any jacket. It's easy to wear throughout your maternity and then also can be flipped and used for baby wearing. If you are pregnant and winter is round the corner, it may be time to buy maternity winter coats. It is better to stay warm and comfortable during the cold winter days wrapped in snug and cozy woolen jackets and overcoats. These overcoats are so popular that you may find a variety in assorted designs and fabrics, helping to make a pregnant woman comfortable, warm and fashionable.